We’re pleased to announce the launch of Nightmare Toys’ brand new website, which aims to deliver a little bit of terror to its clients, wherever they may be. 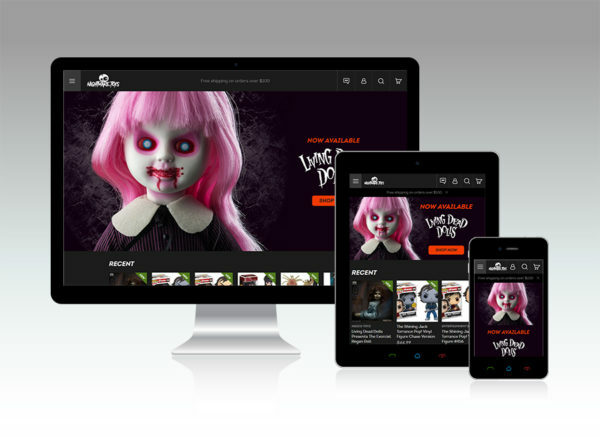 Fans of everything horror and gore will be delighted to browse Nightmare Toys’ fully responsive website, built on the Woocommerce platform and optimized for all devices and resolutions. The website, which oozes darkness and mystery, features a clean, modern theme with a dark colour palette and spooky images to reflect the business’ unique personality. The simplified navigation and flyout menu make browsing and purchasing from the website very easy for customers. Nightmare Toys also has a brick and mortar store, located in Madison, Alabama, where they sell equally spooktastic merchandise. Visit their website today, and share your thoughts by commenting below.